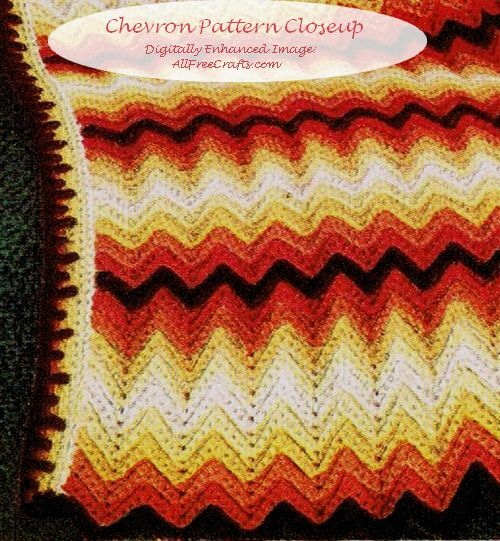 Editor’s Note: I love the rich, warm colors in this chevron afghan, which is a 1952 J&P Coats and Clark vintage crochet pattern using Red Heart Knitting Worsted. The colors cited in the pattern are likely discontinued, but there are many modern alternatives. 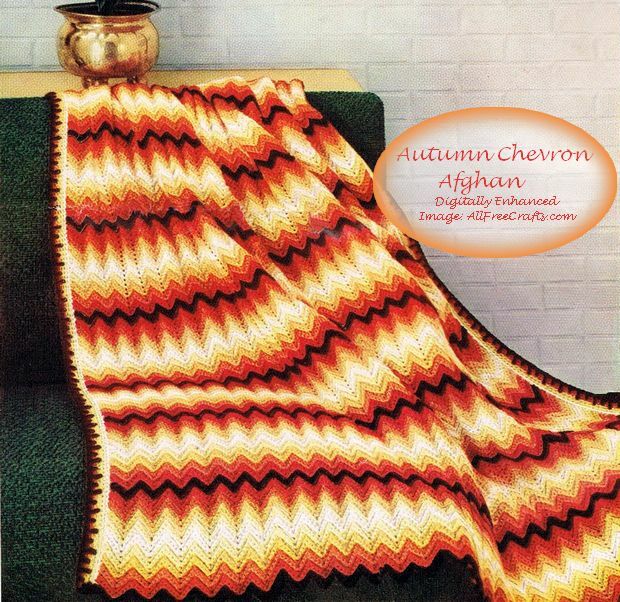 Just for fun, I played around on my photo software, to see what this chevron afghan might look like in different hues. As you can see, the Wood Brown rows (which look black in the photos) are a very definitive feature. It works perfectly for the Autumn colors, providing just the right dramatic “punch”. But, for a more subtle color scheme, I would replace these starkly contrasting darker rows with a shade that stands out somewhat while also complimenting or coordinating with the rest of my color palate. What do you think? An experiment with color combinations for the chevron afghan. Without further ado, here’s the pattern, complete on this page. Enjoy! Finished size is approximately 48 x 60 inches. CHADWICK’S RED HEART KNITTING WORSTED, 4 Ply, Art. E.245: 36 balls (/13 oz. balls) each of No. 243 Mid Orange. Clark’s O.N.T. Plastic Crochet Hook No. 6. GAUGE: Each chevron measures 1½ inches across; 3 sc-rows make 1 inch. STRIP… Starting at lower edge with Wood Brown, ch 60. 1st row: Sc in 2nd ch from hook and in next 3 ch, * 3 sc in next ch, sc in next 3 ch, (insert hook in next ch, draw loop through) 3 times; thread over and draw through all loops on hook (2 sc decreased), sc in next 3 ch. Repeat from * across, ending with sc in last 4 ch. Ch 1, turn. Hereafter pick up back loop of each sc. 2nd row: Dec 1 sc – to dec 1 sc, work off 2 sc as 1 sc – * sc in next 3 sc, 3 sc in next sc, sc in next 3 sc, dec 2 sc. Repeat from * across, decreasing 1 sc over last 2 sc. Break off Wood Brown. Attach Tangerine. Ch 1, turn. 3rd to 20th rows incl: Repeat 2nd row, working 2 rows each of Tangerine, Mid Orange, Yellow, Lt. Yellow, White, Lt. Yellow, Yellow, Mid Orange and Tangerine. These 20 rows constitute the stripe pattern. Work in stripe pattern until 10 stripe patterns in all have been completed, ending with a Wood Brown stripe. Break off. Make 4 more strips the same way. Sew strips together neatly, matching stripes. 1st row: Attach White to end of first row on long side and sc in end st of each row across. Break off. 2nd row: Attach Lt. Yellow to back loop of first sc, sc in back loop of each sc across. Break off. 3rd, 4th and 5th rows: Repeat 2nd row, making a row of Yellow, Mid Orange and Tangerine. 6th row: Attach Wood Brown to end of first row on Edging, sc in same place, skip 1 sc on 2nd row, dc in free loop of nex sc, skip end st of next row, sc in end st of next row, skip 2 sts on next row, tr in free loop of next sc, 3 sc in end st of next row, * dc in free loop of next sc on row below, skip next next sc on row in work, sc in next sc, tr in free loop of next sc 2 rows below, skip next sc on row in work, sc in next sc. Repeat from * across, working over other end of Edging the samem way. Break off. Make Edging across other long side to correspond. Block to measurements. So happy that I was able to help, Mary. These are beautiful, classic afghans.